Judith Tarr received her undgergraduate degree in Latin and English from Mount Holyoke College. She went on to earn an M.A. in Classics from Cambridge University, and an M.A. and PhD in Medieval Studies from Yale University. She taught Latin at Wesleyan University from 1990 to 1993. 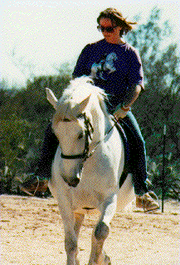 At Dancing Horse Farm, her home in Vail, Arizona, she breeds Lipizzan horses. She's the author of more than 20 acclaimed fantasy novels, including The Throne of Isis (1994), Queen of Swords (1997), and White Mare's Daughter (1998), and five volumes in the Avaryan Chronicles, in addition to historical and science fiction novels. The romance novels she produces under the pseudonym Caitlin Brennan for Harlequin feature dancing horses modeled on those that she raises. Judith Tarr's book Nevertheless, She Persisted was available from LibraryThing Early Reviewers. Judith Tarr's book Forgotten Suns was available from LibraryThing Early Reviewers. Judith Tarr's book Living in Threes was available from LibraryThing Early Reviewers. Judith Tarr's book Beyond Grimm: Tales Newly Twisted was available from LibraryThing Early Reviewers. Judith Tarr's book The Shadow Conspiracy II was available from LibraryThing Early Reviewers. Judith Tarr's book Writing Horses was available from LibraryThing Early Reviewers. Judith Tarr's book Brewing Fine Fiction was available from LibraryThing Early Reviewers. Judith Tarr is currently considered a "single author." If one or more works are by a distinct, homonymous authors, go ahead and split the author. Judith Tarr is composed of 5 names. You can examine and separate out names.